Find all the information you need to know about NY state parks. Browse through detailed reviews of NYS parks, so you can better decide where to spend a beautiful spring or summer afternoon. A Popular Gathering Spot for Locals and Tourists in NY! 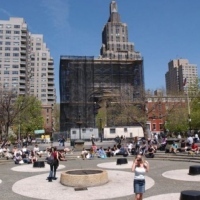 A 9.75 acre park in NYC's famous Greenwich Village, Washington Square is a popular gathering spot for avant-garde artists. It's also a great place to play chess, and to take your canines and children. The park's well-known arch honors George Washington, the man for whom the park was named. The park's fountain is one of the most popular meeting spots in the city. Other features include multiple flower beds and trees, walking paths, a Scrabble playing area, benches, picnic tables, a commemorative statuary, and two dog runs. 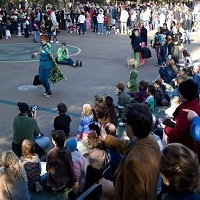 Throughout the year, the park hosts a variety of events and performances. No matter when you go, you're bound to find something fun to do at this great NY park! Are you looking for the perfect outdoor leisure activity? Adirondack State Park in NY is the perfect place for you. It offers supreme preserved nature and many attractions that will make you say “I’ll never forget”! Wild landscapes and beautiful flora and fauna, makes it perfect for skiing, boating, rafting, biking, golfing or hiking. If you choose to spend the night over, you can camp under the stars, get a cabin on the lake or choose from some of the luxury hotels and inns. Spacious rooms with a fireplace and a Jacuzzi tub, delicious food and excellent service will make the time spent here truly enjoyable. Visit the web site for more information. Roberto Clemente State Park was opened in 1973 as the Harlem River Park and was renamed after Clemente, the first Latino-American inducted into the Baseball Hall of Fame. The park covers 25 acres and is ideal for recreational and cultural activities for youth, adults, senior citizens and the physically challenged. During the summer, this state park in NY is home to numerous concerts and special events and there is really something for everyone at it. Pets are prohibited in all parks and facilities. The park is open daily year-round, but facility working hours are subject to change. Visit the website to get information about fees and rates. If you want to spend your day in a relaxing and pleasant atmosphere, visit Beaver Island State Park in NY. It is located at the south end of Grand Island in the upper Niagara River and covers 950 acres. 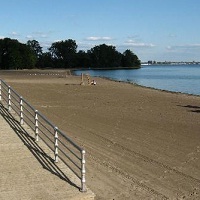 The park features a half-mile sandy beach for swimming, adjacent 80 slip marina with both seasonal and transient boat slips, a nature center, playgrounds, picnic areas, athletic fields, horseshoe pits, an 18 hole championship disc golf course, an 18-hole championship golf course, and much more. In the park you can also visit the River Lea house and museum, home to the Grand Island Historical Society, and Beaver Island Clubhouse featuring banquet and catering facilities. Visit the website for more information. 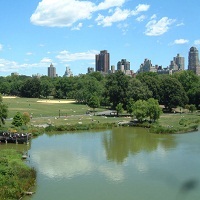 Central Park has been the most frequently visited park in NY for decades, with over 25 million visitors per year. This is the first public park in America and one of the most famous parks in the world. 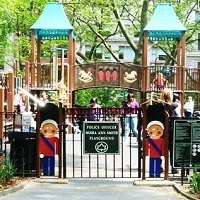 Take a walk along the numerous paths and walking tracks, sit and play chess, take your kids to Central Park Zoo or explore the rest of the countless possibilities the park offers. Go on a picnic or just play badminton with your friends in some of the plentiful grassy areas. Indoor attractions include the Swedish Cottage Marionette Theatre, Belvedere Castle, and the historic Carousel. You can attend some of the many events and summer festivals, too. Relieve the monotony of your everyday life and embark on an exciting adventure at Niagara Falls State Park in NY. 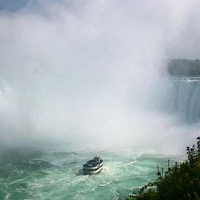 After you have witnessed the park’s main attraction, splendid Niagara Falls, you can continue your adventure at Cave of the Winds Tour to the Hurricane Decks and get your best “water park” experience, or on the Maid of the Mist boat ride, which will take you to the base of the Falls. There are four parking lots available, and each of these is connected to the park’s attractions and lookout points via The Niagara Scenic Trolley system. If you prefer to walk or are keen to explore the park for yourself, the park offers numerous hiking trails. If you get hungry, you can choose from the many dining options available. But, if you want the supreme dining experience, delight in the spectacular view and American cuisine at the Top of the Falls Restaurant. Situated in Northern Jamaica Bay, in New York, Spring Creek Park is a 55 acre area of undeveloped lands and wetlands. It consists of grassy marshes sheltered from the Atlantic Ocean by the Rockaway Peninsula. The bay contains many islands, but only the largest, Broad Channel, is inhabited. 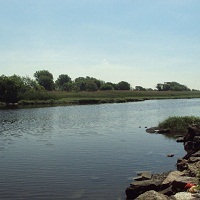 The Jamaica Bay Wildlife Refuge is located on the northern part of the island. The Refuge contains two freshwater ponds and is inhabited by many shorebirds such as great blue herons, egrets, red-winged blackbirds, pheasants, and mallards. The park, as well as the surrounding area, is a haven of unspoilt wilderness, which makes it perfect for any nature lover to come and enjoy any time of the year. Evangola State Park has been open since 1954. 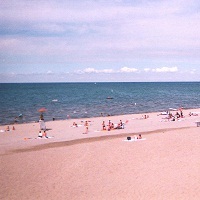 The park fronts Lake Erie and its main asset is the large swimming beach which has been identified as the least polluted beach in Erie County. Evangola is one of the Top 100 campgrounds in New York as named in 2007. It has 80 campsites and one cabin available during the camping season from mid-April to late-October. The campground has flush toilets and hot showers. Spend memorable moments enjoying many activities all year: swimming, biking, hiking, fishing, camping, golfing, snowmobiling, etc. If you are a true romantic, you can organize your wedding in a 125 person banquet room overlooking the beach. Call or visit the web site to book your reservation. 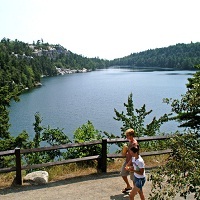 If you are bored at home and suppressed by everyday routine, visit Minnewaska State Park in New York. It is just an hour and a half drive away from New York City. Located on the Shawangunk Mountain ridge which rises more than 2,000 feet above sea level, the park offers many attractions. 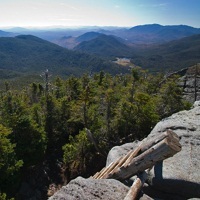 Minnewaska State Park Preserve is host to Peregrine falcons, the species which has disappeared from other parts of NY. You can engage in a variety of activities, such as biking, rock climbing, hiking, swimming, boating and much more. Sit by the clear stream and spend wonderful time admiring the scenery. Waterfalls, three crystalline sky lakes, dense hardwood forests, incising sheer cliffs, and breathtaking views make it perfect for family gatherings and outings. Pelham Bay Park is the largest public park in New York City. The park is the perfect place for daily outings with your friends and family. It offers miles of bridle paths and hiking trails, two golf courses, a 13-mile saltwater shoreline, many playgrounds, and a lot of greenery. Pelham Bay Park also has a wide and diverse range of plant and animal life and features prime locations to view one of nature's most skillful hunters, the osprey. In the park you will see many National Historic Landmarks, such as the Bartow-Pell Mansion, the Orchard Beach, the Split Rock, American Boy (a standing male figure), etc. Visit the website for more information about the events which are being scheduled all year long. 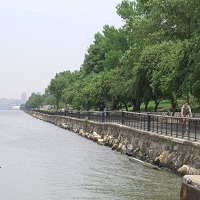 Planted by the 1200 volunteers, Carl Schurz Park is a New York state park that is a peaceful oasis in the middle of New York City. It stretches along the East River and offers an excellent view of the Roosevelt Island Lighthouse, the Triborough Bridge, Randall’s and Wards islands, and Gracie Mansion, the 18th century mansion that serves as the Mayor's official residence. In the fall, you can enjoy the two major events: the Gracie Square Art Show and the Halloween Howl, one of the city’s favorite canine costume competitions. The park offers plenty of green space, which is an excellent place for picnicking, sport activities, or sunbathing. Madison Square Park was opened to the public in 1847 and since then, it has been one of the most famous parks in New York for a reason. It offers many interesting possibilities for spending an enjoyable day. Plenty of green areas make it a great place for going on a picnic with your friends and family. You can play volleyball, read books, listen to music, sunbathe, or just relax and watch people. At Madison Square Park you can have free Wi-Fi the moment you register a free account. Come and enjoy the landscape of the park designed by noted horticulturists and landscape-gardeners. Let your kids have fun at the playground which is open year-round from 7am to dusk. If you get hungry, stop at the Shake Shack and buy hamburgers, hot dogs, shakes, as well as wine. 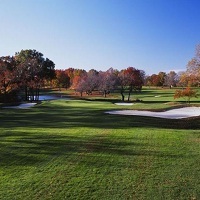 Bethpage State Park is a 1,476 acre New York state park which offers countless amenities and activities to make your visit fun and enjoyable. The park contains many picnic areas, hiking and biking trails, a polo field, and tennis court, but it is best known for its five golf courses. 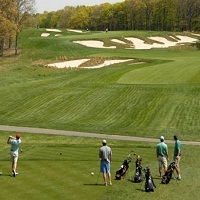 One of them, Bethpage Black Course, hosted 2002 and 2009 US Open Golf Championship. In the park you will also find a restaurant and catering facilities, a Golf Pro Shop, and a driving range. Pets are not allowed. The park is open all year long, but facility operations are subject to change. Call for more information. Marine Park is one of the largest state parks in New York. It has 798 acres of grassland and a precious salt marsh, protected as a Forever Wild reserve. Enjoy the many amenities the park offers, such as golf courses, baseball fields, bocce courts, biking and hiking trails, kayak/canoe launch sites, multiple playgrounds, and much more. You can go on a picnic and enjoy the park’s unique flora and fauna or go with the Urban Park Rangers to the Salt Marsh Nature Center and take place in many educational and fun activities. You should pick your pleasure and come to Marine Park. Visit the website to get information about upcoming events. 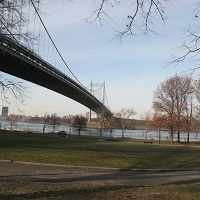 Astoria Park is located along the East River in the New York City borough of Queens. It is best known for its swimming facilities which meet the Olympic standards. 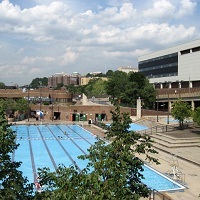 The main pool is the largest in New York City and offers many ways to spend an enjoyable day and have fun on water. The park features a diving pool and a wading pool as well. Astoria Park provides more than aquatic pleasures. A peaceful environment, dog-friendly areas, a running track, 6 tennis courts, a bocce court, and a skate park are there for you to enjoy with your friends and family. Come on Independence Day and be entertained by the Queens Symphony Orchestra and the spectacular firework show. Visit the website to get information about upcoming events at this NY state park. Flushing Meadows–Corona Park is the second largest state park in New York City. It provides many facilities which allow you to spend a wonderful day. 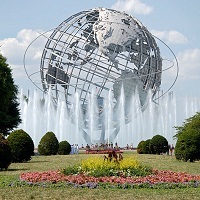 The park is, probably, best known for the USTA Billie Jean King National Tennis Center, the current venue for the U.S. Open tennis tournament, and Citi Field, the home of the New York Mets baseball team. You can visit the New York Hall of Science, the Queens Museum of Art, the Queens Theatre, and much more. If you want an active vacation, you can enjoy many sport facilities the park offers, such as baseball and football fields, swimming pools, basketball and handball courts, golf courses, etc. Get on your bicycle, or take a walk along beautiful walking paths and admire beautiful surroundings and a lot of greenery in the middle of the city. Pets are allowed, too. Whirlpool State Park is located in Niagara County, New York, north of the city of Niagara Falls. 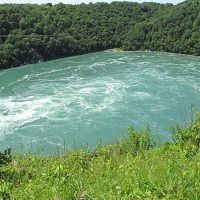 The park overlooks the Niagara Whirlpool on the Niagara River and the lower Niagara Gorge. It has two levels. The upper or the street level has many spectacular views of the swirling waters of the rapids, the whirlpool and the Niagara River Escarpment. The lower or the river level is accessible by walking the 300 feet of trails and steps that descend into the gorge. The park offers many amenities that will make your day fulfilled. Bring your friends and family and enjoy gorgeous nature, biking and hiking trails, many playgrounds, picnic places and picnic tables, fishing areas, etc. Break your daily routine and visit Golden Hill State Park in NY. 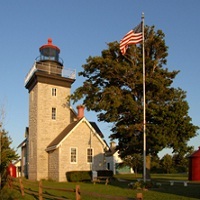 The park offers camping, fishing, boating, shoreline hiking, picnicking, nature walks, snowshoeing, walking tours of the lighthouse site, and much more. You can enjoy your stay while admiring the view of Lake Ontario. One of the park’s biggest attractions is the Thirty Mile Lighthouse which is available for rental year-round. At the Lighthouse Cottage, renters are provided with a private picnic area with a barbecue grill and a picnic table. This rental offers a kitchen with a refrigerator, an electric stove, a microwave, a coffee maker, cooking utensils, silverware and dishes, a living room with an electric fireplace, a couch, two chairs and a writing desk, a full bathroom with an old fashioned bathtub, three bedrooms with queen size beds and pillows. Visit the website for more information. 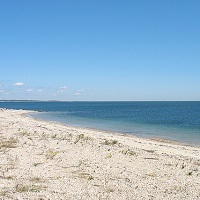 Orient Beach State Park is located on the eastern tip of the north fork of Long Island. This NY state park is a natural wonderland with 45,000 feet of frontage on Gardiner's Bay and a rare maritime forest which is home to red cedars, black-jack oak trees and prickly-pear cactuses. Because of its natural beauty, in 1980 the park was named as a National Natural Landmark. If you want to relax and enjoy the peaceful outdoors, the park is the perfect place for you. The place also offers numerous opportunities for fun and recreational activities, such as swimming in the bay, fishing, kayaking, windsurfing, hiking, biking, and much more. A wooden deck provides a panoramic view of Gardiner's Bay with sailboats and other watercraft passing by. The park features many programs and special events, as well. 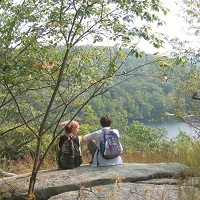 For all outdoor enthusiasts, Fahnestock Memorial State Park in NY is a great place to be at. It covers an area of 14,086 acres and boasts beautiful preserved nature. The park offers countless amenities and attractions which make it one of the best places for an outdoor adventure. You can bike, hike, watch birds, hunt, camp, and much more. The park has a beautiful beach and great picnic areas. In addition to swimming, campers and day trippers can fish in or tour Canopus Lake by row boats which are available for rental by the hour or the day. Pets are not permitted neither on the beach nor in the picnic areas, but they are allowed in all campsites. Park hours and facility operations are subject to change. Visit the website for more information.